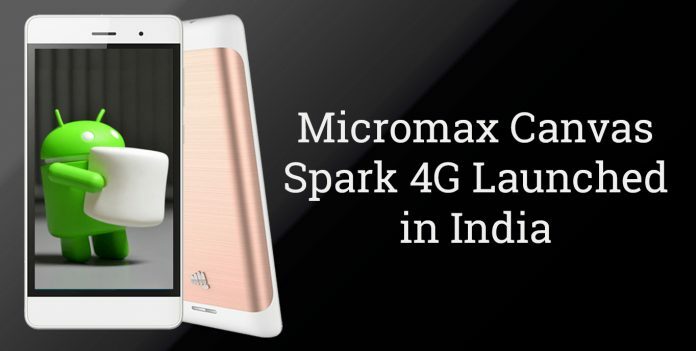 Micromax Canvas Spark 4G has been launched in India for Rs. 4,999 and is available exclusively on Snapdeal from 10th November onward. To our surprise, Canvas Spark 4G will come with an Unlimited 4G Jio offer for a limited time. As of now, the phone will only be available in White Champagne colour. Coming to the specs of Canvas Spark 4G, it has a 5.0 inch (12.7cm) IPS display with a resolution of 854 x 480 pixels. The display is protected by Corning Gorilla Glass. The build quality of the phone is average, but luckily it has a metal back cover to save the phone from an accidental drop. It comes pre-loaded with Android Marshmallow which has close to Stock Android UI. In addition, it has some pre-installed apps. As far as performance is concerned, it is powered by 1.3GHz quad-core processor and 1GB RAM. The onboard memory of Canvas Spark 4G is 8GB which can further be expanded by using microSD card up to 32GB. It has a 5MP primary camera with LED flash accompanied with a 2MP front-facing camera. The phone has the dimensions of 144 x 72.7 x 10.6mm and weighs around 165 grammes. Other features are Dual-SIM support, 4G, VoLTE, WiFi 802.11 b/g/n, Bluetooth v4.0, GPS and 3.5mm audio jack. Canvas Spark 4G is packed with a 2000mAh battery which can deliver 15 hours of backup on normal usage. As mentioned earlier, Spark 4G is priced at Rs. 4,999 and can only be purchased via Snapdeal from 10 November onward. The pre-booking has already started on Snapdeal. Some other alternatives in the similar price range are Micromax Yu Yuphoria, Yu Yunique, XOLO Era 4G, LYF Flame 8 and Intex Cloud S9.